BORN: Cranston, Rhode Island, United States, June 13, 1967. Selected by Buffalo Sabres in eleventh round (twelfth Sabres pick, 211th overall) of National Hockey League entry draft, June 13, 1987. Signed as free agent with Tampa Bay Lightning, August 27, 1992. Signed as free agent by Boston Bruins, August 6, 1993. Named to Hockey East All-Star Second Team, 1987-88. Named to National Collegiate Athletic Association (East) All-American Second Team, 1988-89. Named to Hockey East All-Star First Team, 1988-89. Shared (with Darcy Wakaluk) Harry "Hap" Holmes Memorial Award (AHL), 1990-91. Named to American Hockey League All-Star First Team, 1990-91. 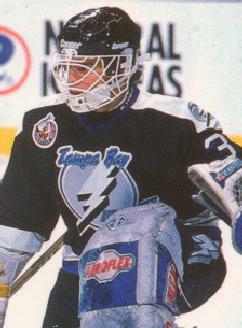 Named to American Hockey League All-Star Second Team, 1991-92. Winner, Harry "Hap" Holmes Memorial Award (AHL), 1991-92. David spent a summer playing for Roller Hockey International's Los Angeles Blades. Selected by Buffalo Sabres in 1987 National Hockey League entry draft. Signed as free agent by Tampa Bay Lightning.